Magna will take over the development of a new Opel Astra model. Just a year ago, Magna attempted to acquire the whole German GM subsidiary, but the takeover was aborted by General Motors. Magna Steyr’s automobile production plant in Graz is on the road to a new business. As the Handelsblatt reports, the supplier group has good chances to grab the contract to develop the successor model to the Opel Astra Cabriolet. 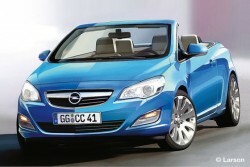 The car should hit the market in 2013 and replace the current Astra with the folding roof.